[update] Since writing this post official site for this software had disappeared and last version is very outdated and unmaintained. File sharing servers are often perceived as something large, mysterious and hosted in Germany (until kicked out to third-world countries). I’ve already posted about software to easily create HTTP and FTP servers for file-sharing, this time it’s bit larger and about hosting solution for actually exchanging files using Direct Connect protocol. One computer runs server software to create so-called hub. Users run client software to connect to hub and get chat-like environment plus ability to share files to other connected users. Depending on specific versions of server and clients various features are supported or not. Most advanced apps allow downloading files from multiply users at the same time and exchange of partially downloaded ones. Files are hash ed much like in other file-sharing solutions. DC-hubs never really boomed on world scale like eDonkey and BitTorrent did. Still they are excellent solution where connection to users on same provider or in same country is much faster than to global Internet. 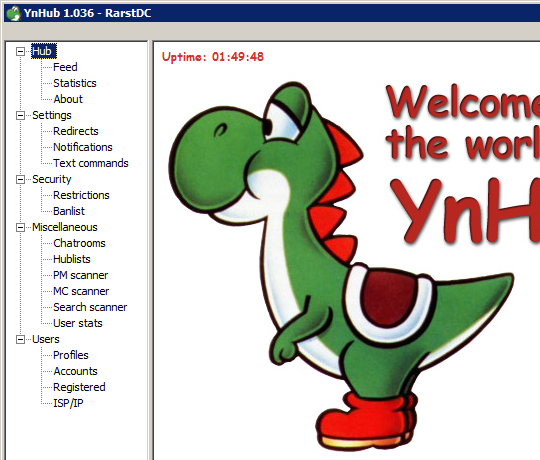 YnHub (Yoshi and Nev Hub) is hub server software for Windows environment (alternatives are mostly for Linux). It is relatively easy to setup and has light resource consumption which makes it perfect for building personal file-sharing solution. Press Start Hub on home screen. Solve firewall and port forwarding issues if any. Basically you already have hub running. By default most settings are blank so it’s in free-for-all mode. To make it private you can either setup ISP/IP restrictions or only let registered users in. Check Users > Require an account . Create profiles in Users > Profiles . Something like Admin and Regular will do. Create specific accounts in User > Accounts . With such setup hub will reject anyone who doesn’t provide login details matching one of accounts. There is ton of different clients available and large hubs often insist on specific (or even customized) ones. I am not huge expert on DC but mostly used StrongDC++ and it works just fine. So it’s a decent client to start with for your own network. It is portable so you can do initial setup with adding your hub IP address to favorite hubs of app, archive it and distribute to those you want to participate in your network. Reminded me of my old school days. The only thing I still don’t know about YnHub is how to create bots in it using my custom apps. I never dived really deep in there. :) More settings than I need. Torrents are obviously great but it’s much harder to handle regional/ISP specific control with them. Hosting tracker is not two clicks either. DC is good for creating non-global file sharing solutions. same network, but more faster and new look. Hadn’t used that client myself. Thanks for the wonderful info. Will try to setup own p2p and ask my friends to download the files. Yeah, using 3rd party file-sharing services or sending files directly with IM are both far from handy. If moving lots of files around own service works better. See post on YouGetSignal on how to check for you external IP and if port is forwarder properly. Note that if your provider doesn’t provide external IP then clients won’t be able to access any server you run. yar hub is gr8…! i just luv it…! Glad it works fine for you. :) Going to try running one (again) myself soon. sure…! really i’ve really gr8 feeling when ppl call main admin…! :-D its gr8 to listen……!